Local playwright/artist/B-movie enthusiast Larry Blamire toted along an eclectic skill set when he relocated to Hollywood a decade ago, and he seemed to pour much of it into his filmmaking debut, “The Lost Skeleton of Cadavra,’’ a microbudgeted spoof of cheesy ’50s sci-fi. Enough people shared Blamire’s passion for Ed Wood movies and “Catwomen of the Moon’’ to earn “Cadavra’’ a studio pickup, a cult following, and the occasional follow-up opportunity, including a pair of 2009 projects alternating screenings at the Coolidge starting today. Blamire gathers his regular troupe for “The Lost Skeleton Returns Again,’’ a sequel that ups the production values slightly, but keeps that familiar woodenness intact in riffing on the 1960 version of “The Lost World,’’ among others. Semi-coincidentally, there are also more than a few echoes of “Indiana Jones 4’’ in the film’s freewheeling jumbling of jungle adventure, sentient skulls, intelligence agents, and spaceships. Blamire’s hero scientist, Dr. Paul Armstrong, has a bit of attitude this time, thanks to a two-year stint in the Amazon that’s left him amusingly bitter and boozy. The rare rock deposit that’s the source of his misery brings Paul plenty of company, including a government operative (Frank Dietz) accompanied by Paul’s wife (Fay Masterson), and a crook (Kevin Quinn) whose boss wants to beat the government to the prized resource. Meanwhile, average joe Peter Fleming (Brian Howe of “Gran Torino’’) is compelled to join the hunt by an insidiously nagging supernatural skull he’s inherited — the only remnant of the Lost Skeleton, which played similar mind tricks on Peter’s late twin brother in the original. The dry-witted, foolish interplay between the characters recalls Zucker brothers standouts like “Airplane!,’’ and Blamire’s script is especially funny when shrugging off sequel improbabilities and catch-up exposition. (She-alien, annoyed: “We waste time explaining things we already know.’’ He-alien: “We waste time acknowledging that we already know these things.’’) The movie struggles to maintain its wryness past the halfway point, though, as the characters’ arrival at the deliberately unconvincing Valley of the Monsters — presented in “Superskeletorama’’ color — marks a shift to broader stuff, like the kitsch-exotic Cantaloupe People. It’s the difference between a deadpan stare and wink-wink-nudge-nudge. This issue is a bit stickier in “Dark and Stormy Night,’’ Blamire and friends’ manic throwback to mystery-manor pictures of the ’30s. Bantering reporters 8 O’Clock Farraday (Daniel Roebuck, “Lost’’) and Billy Tuesday (Jennifer Blaire, Blamire’s wife) are among the group that gathers for the reading of a wealthy oldster’s will, hosted by the estate’s upper-crusty heir apparent, Burling Famish Jr. (Howe again). Cue thunderclaps, blackouts, murders with nary a witness, a fake-gorilla cameo, and a whole lot of bustle — screwball suspense, if you will. A lot of what we hear sounds like something pieced together with one of those fridge-magnet poetry sets. 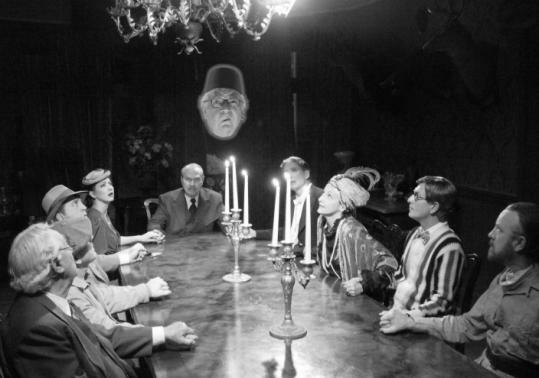 “I was myself once one of you — an idiot,’’ says resident mystic Mrs. Cupcupboard (Alison Martin) as she prepares to lead the ensemble in a seance. “The frog of uncertainty danced in my hat, too, as they say.’’ It’s a fun line, but also a case of the movie pressing so hard it’s a little exhausting. The patter and performances will grow on you, but only after you’ve built some stamina.